As you may recall from recent posts, I moved to a new state and thus a new barn. I also am leasing a new horse. This guy's name is Nikodemus. Niki D has begun to irritate me over the past few weeks. He has consistently had no respect for my personal space on the ground; he has been biting me and chewing up my tack; and he wouldn't pay any attention to me when it was time to mount by grazing so that it would take me like 20 minutes to get on him. I was starting to get anxious about this when I wasn't with him. How to control him began to wake me up at night. So silly. The biting issue was my biggest issue. There were two things I read which I decided to try out, though I had little faith: stop hand feeding the horse, and don't get close enough to the horse to let him bite you. I also renewed by subscription to Giddy Up Flix. I ran into this video called "Defining your Space" by Gawani Pony Boy. This seemed EXACTLY what I needed to do and wanted to do. Below is the trailer. Side note, which you may elect to skip over follows! 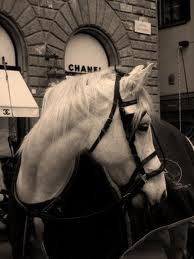 The whole "natural horsemanship" thing seemed like it made some kind of sense, though I personally feel that anything defined as "natural" is a subjective, culturally infused concept. Based on a medical anthropology graduate education, "natural" is a shifting concept very much related to the time frame and concept in which it is used. In my mind, "natural hosemanship" works because it has an underlying theory. That's it. There is nothing "natural" about it. It is really just a consistent, theoretical approach and framework and works because of its consistency. But really, I digress. Every time I watch one of these "natural horsemanship" videos, they always seem so....un-me. The practitioners are usually Western riders and generally male. They use round pens to which I do not have access. The horses are usually not warm bloods. You don't see dressage riders parading this stuff. Everyone at my last hunter barn totally made fun of the concept. So, after watching "Defining your Space," I thought to myself, "I don't know if this is for me." Mr. Carrots really thought I should try it out though. Gawani Pony Boy's first exercise is controlling the horses feet in a round pen. He did a few moves like throwing a rope in front of the horse and making noises at the horse. The goal is to get the horse going around you in a large circle, controlling his direction and distance from you. Didn't know if I could swing this. The second exercise was leading the horse, expecting him to stop three feet behind you, and then stepping back when you turned around at him. Amazingly, this all worked. I put a minimum amount of effort into this for a massive pay back. I sort of modified each of the exercises into something that seemed do-able for me as a small, timid-when-it-comes-to-horses lady. I took Nik-the-Mouth into what I had available: a square turnout. I took him off the lead and let him go naked. He cantered off, immediately into a circle around me. I was able to get him to go in the other direction by just twirling the lead when he stopped. This was FAR easier than I thought it would be. Then, I did the exercise where I would lead him. It seriously took the horse about 3 walks then stops to totally get what I wanted. He was so smart. Lastly, I did this "still as a statue" exercise that I saw Julie Goodnight do once. And the results? For about twenty minutes of ground work, I now have a horse that leads beautifully, doesn't try to graze when walking back from turn out, does not bite and pays attention when it is time to mount. I am so thrilled and I couldn't have asked for more. Really, I just could not have asked for more. My whole point is that this ground training thing is perhaps easier than it may at first seem. And you don't have to do exactly what the person you watch does. You can modify and make it something that works for you, your personality, and the tools that you have available. I am a huge fan of the professional, classy and elegant blog Dappled Grey. I was SO excited to see DG's March Giveaway for the beautiful and quirky artist Dark Horse Studio. 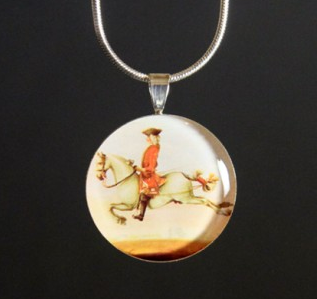 Dark Horse does fantastic jewelry and greeting cards that are old-timey and quite clever. Below are a few of my favorite pieces! Dark Horse has a "coming soon" on cuff links! Can't wait for those....Mr. Carrots has some new man-jewelry in his future! Screen shot from Dark Horse Studio website. 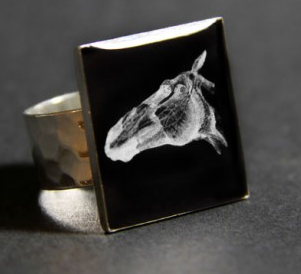 Anatomy Horsehead ring. I'm always a sucker for an anatomy piece. I think this is my favorite piece of Dark Horse Studio. 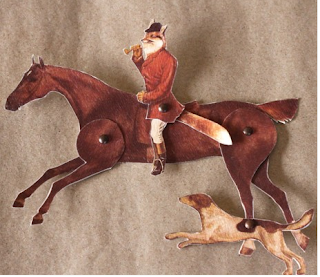 As you may well know, I am a fox hunting enthusiast. 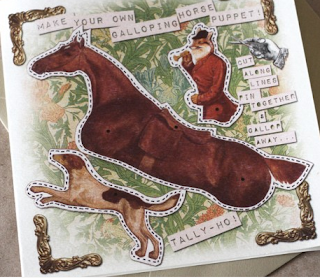 This greeting card transforms into a puppet!!!! Aren't you glad that I didn't keep this giveaway to myself? Because I am less likely to win now that y'all are going to enter too. What are your favorite pieces from Dark Horse Studio? I wanted to share my new barn with you! My new trainer is Claire of Darnell Dressage. Hope you enjoy. Vlog - Kingsbridge Farm from Fourteen Carrots on Vimeo. Frilly, girly summer show shirts! If you read my 2013 wishlist, you may have gotten the impression that I am somewhat girly in my taste. 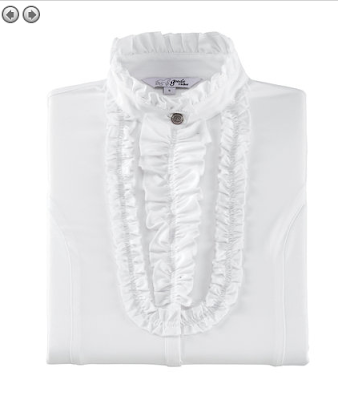 In particular, I blogged about the Equiline Lissome Dressage Show Shirt. The shirt is over $200, putting it out of a lot of our price ranges. I saw the shirt on a rider in Thermal, and it was totally dusty and dirty. While flipping through the pages of Dover's Spring catalogue, and noted some pieces that have the feel of the Equiline Lissome. These options are lighter on the pocketbook and not so heartbreaking to get all grubby and dirty during the summer. And here we have some alternatives! This is the Goode Rider Regal. Next up we have the Joules Frilsden. It's got a ruffly collar. And it comes in both pink and baby blue! Not bad at ~$53. Let me know if you've seen any eyelet knockoffs of the Lissome! We've got the ruffles covered, now we just need an eyelet! Another video! Very happy with my SmartPak Big D Bridle Bag and Saddle Carrier. Thought I would do a review of them for you. I always find myself wanting more photos than are offered on most products in the online tack shops. So, just in case anyone is in the market for a new bridle bag or saddle carrier, I think these are two great considerations. SmartPak Big D Review from Fourteen Carrots on Vimeo. HITS Thermal Haul from Fourteen Carrots on Vimeo. During my recent visit to HITS Thermal, I had a jaw dropping moment when I saw the number of vendors present. Even Mr. Carrots was enthusiastic about how much horsey shopping was available. I would describe the layout as the Four Corners of the Financial Apocalypse. Below are the four shopping districts at HITS. I spent the majority of my time and money at LA Saddlery's mobile headquarters. These breeches were a crowd favorite. 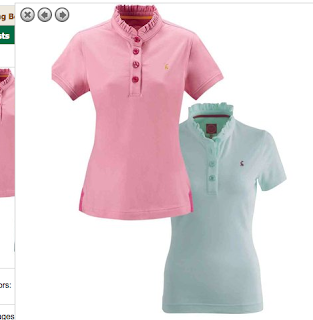 On the right is Le Fash's new spring style!